TheBloomOutlet.com | Chinese New Year is always one of the most important celebrations in a year, especially among the Chinese people. And like any other celebrations, exchanging gift is an important part of it. Chinese new year gift is what we can do to share happiness, cheer, and joy in a good way. Moreover, exchanging gift in this kind of special occasion could strengthen the bonds and relations to each other. That’s why you have to prepare your best gift for the special ones. 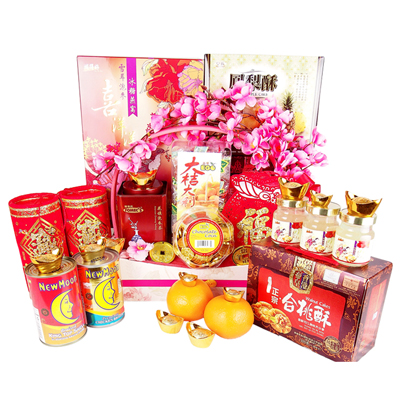 One of the most thoughtful and considerate gifts you can give in this new year is a Chinese New Year hamper. There is a wide selection of hamper you can choose and buy in the flower shop, online or offline. No wonder since this is the most preferred gift in such occasion. A hamper gift is not only appropriate to give, but it also looks fancy, creative, and simple at the same time. Among all, chocolate is the most popular filler for a hamper. Chocolate always able to bring a good mood and happiness to anyone who receives it, that’s why chocolate is so preferable. Besides, chocolate also always associated with celebrations like Chinese New Year. A Chinese New Year hamper that consists of fruits are also the best gift you could think of. It is because almost everyone loves fruits and nobody would receive such delicious and healthy edibles like fruits. There is also a huge selection of fruits you can choose, and you can make it fits with the taste of the receiver if possible. Aside from chocolate and fruits, you can also fill the basket gift or the hamper gift with other edible things such as crackers, an assortment of milk, almonds, coffee, natural honey, and many more. Not only about foods or drinks, but a hamper also can be filled by some other good stuff such as books, teapot set, perfumes, and so on. This way, you can be creative with your hamper, and you can make it even look more personal and special to the receiver. After all, you need to prepare your Chinese New Year hamper thoughtfully and with care, if you want to send your best regards to the receiver. You can make the hamper on your own, or you can simply order the hamper from an Flower Delivery Singapore company. Choose a good reputable florist online shop with the best products or enables you to personalize the hamper with stuff you want, and celebrate your Chinese New Year in the best way possible!